Public forums like the law courts featured a wide spectrum of society acting out small and large life dramas. They made ideal places for artists with an interest in social justice to capture a "slice of life." 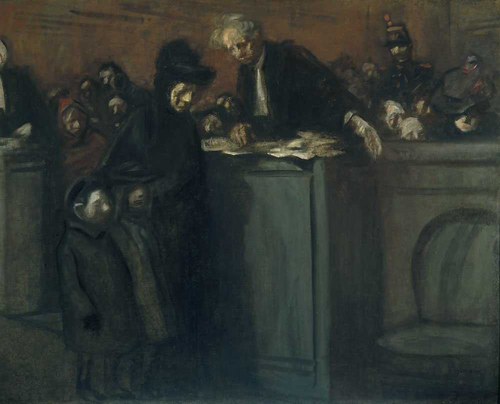 A second lawyer, also dressed in long black robes with white collar, stands at a similar podium at the far left of the painting. Some of the spectators may be plaintiffs or witnesses waiting their turn to be called. A young boy and girl, each dressed nicely in coat and hat, are most likely the woman's children. Dressed all in black, including an elegant feathered hat, this woman is likely a widow appearing in court to finalize the legal aspects of her husband's estate and provide for her children. Wearing black robes and a white collar, a lawyer stands behind a raised podium covered with papers. His left hand gestures to the woman, possibly guiding her to the chair next to his desk. Standing at the back of the courtroom, a uniformed soldier keeps an eye on the crowd. This particular female spectator is wearing a large, fancy hat decorated with red flowers. A low wall separates the current courtroom drama from a crowd of people.